Rose, our resident Kitchen & Bath expert is sharing five tips today for updating your bathroom. As it's often too costly to do a complete design overhaul, there are a bunch of basic things you can do to renew your space. It starts with one of the easiest ways to make a difference- paint. Obvious perhaps, but it's worth mentioning. 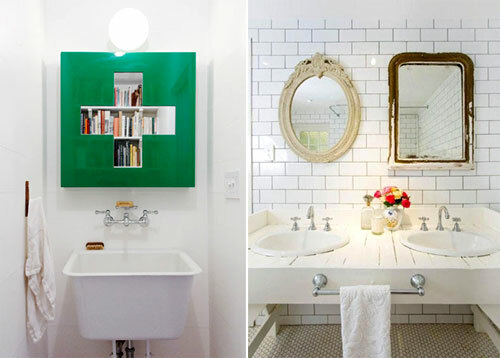 But this time, why not try a bold color like turquoise or kelly green? Another good option for updating the bath is replacing those old faucets. The bad chrome with the plastic handles or the hideous polished brass faucets gotta go. 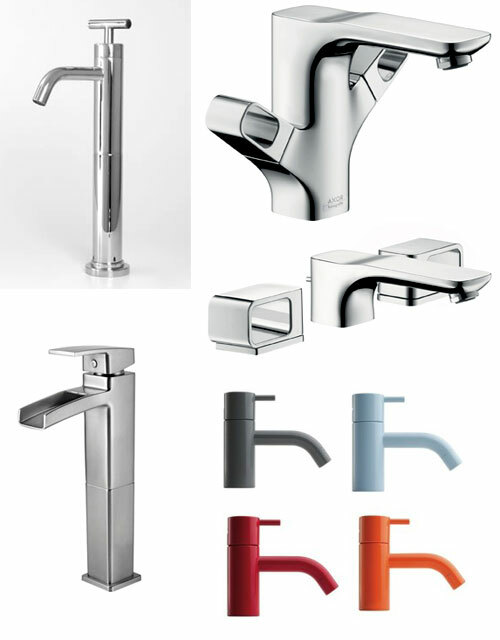 There are a ton of great options out there and above are some of Rose's favorites, which include Hansgrohe and Sigma. Also, when replacing a new faucet, the best thing to do is take a picture on your phone of your existing faucet and/or measure from the center of your hot handle to the center of your cold handle, which will help you or a salesperson know which style at the store works for your sink. If you're looking for a more modern look, Rose recommends a brushed nickel. If your style is more classic and traditional, try the polished nickel. I'm currently loving the Brooklyn Bath Faucet by Watermark, above. This reminds me, I could use a new light in my bathroom. Rose recommends changing out the old and bringing in something a bit more current. This certainly doesn't have to be costly as many a yard sales and Habitat for Humanity's have tons of great light options. The great thing is it doesn't have to be a traditional, boring bathroom light anymore. Have fun with it. Number four on Rose's list is cleaning or replacing the tile. Rose recommends hiring a professional to redo the caulking if you've never done it before as you don't want it to look like a hack job, which is easy to do. She also mentioned that there are professionals out there who can change the grout color, which can instantly update your tile. For lower cost tile, check out your local Habitat for Humanity or the discontinued stock at tile showrooms- they all have them. Or try Craigslist. It's amazing what you can find.